The Cameroonian government has denied all responsibility for the filmed deaths of two women and two children, despite army uniforms being visible on screen. Amnesty International identified the weapons used in extrajudicial killings by Cameroonian armed forces as being of Serbian origin. It has urged Serbia to stop its arms trade to Cameroon due to the government’s “systematic violations” of human rights, and that its violent responses to Ambazonian activists were "unlawful, excessive and unnecessary”. Amnesty International told BIRN that Cameroon has used Serbian-made weapons in a pattern of "systematic violations" of human rights, and has called on Serbia to suspend arms export to the African state. “Given the credible evidence of a Zastava M21 being used by Cameroonian soldiers to carry out the horrific extrajudicial executions of two women and two young children, Serbia – a major supplier of small arms to Cameroon – should suspend further supplies,” Patrick Wilcken, an arms-control researcher at Amnesty International, told BIRN. “This is not the first time Amnesty International has documented human rights abuses by Cameroonian forces using Serbian small arms. Rather, it reflects a pattern of systematic violations,” Wilcken added. The comment came after both Amnesty and Bellingcat stated that they had verified that the gun seen in the video of the execution of the women and children, accused of belonging to outlawed Islamist terror group Boko Harram, was a Serbian-made Zastava M21. The gun is produced in the state-owned Zastava arms factory in the central town of Kragujevac. Serbia’s Ministry of Trade, which issues arms export licenses, and the Ministry of Defence, did not reply to BIRN’s questions on arms sale to Cameroon by the time of publication. According to data from the UN/Arms Trade Treaty, Cameroon has been one of the largest recipients of Serbian weapons since 2013. BIRN reported in September last year that tweets had captured images of Serbian-made Coyote machine guns in Cameroon and Nigeria – apparently seized from Boko Haram fighters. Issa Tchiroma Bakary, Cameroon’s Communication Minister, dismissed the video as fake news, but said the authorities would conduct an investigation. “Although we have demonstrated that this is fake, the head of state has instructed the Minister of Defence to open a thorough investigation in which no stone should be left unturned," UK’s ITV quoted Bakary as saying. “The Cameroonian authorities’ initial claim that this shocking video is fake simply doesn’t stand up to scrutiny,” Samira Daoud, Deputy Director of Amnesty International’s West Africa office, said in Amnesty’s report. Paul Biya, who has been Cameroon President for 36 years, is facing accusations of brutal human rights abuses. 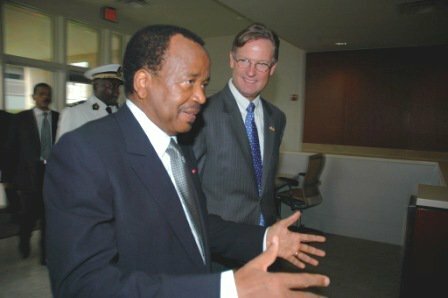 On 13 July 2018, the Associated Press reported that Biya is "one of Africa's longest-serving leaders" and that "he oversees an increasingly restive Central African nation that faces an Anglophone separatist movement and the threat from Boko Haram extremists crossing the border from Nigeria."